As you may know from my recent postings on Facebook and Twitter, I just returned from Italy where I spent several weeks shooting a grilling show for Gambero Rosso (“Red Prawn”), a food and wine magazine and publishing group founded in 1986. It was an over-the-top experience, exploring the Italian boot with a small crew, meeting grilling and smoking impresarios from Piedmont to Tuscany to Venice. Today, the acceptable temperature has been ratcheted back to 165 degrees. But the turkey (especially if it’s organic, which is usually a bit leaner) will still need a little help to reach its full potential. While shooting Season 3 of Project Smoke this past spring, I smoke-roasted what may have been the best turkey of my cooking career. You can bet I’ll be recreating it for the Raichlen family Thanksgiving this year. I call it the Raichlen “Butter Ball.” Here’s how you make it. Start with the best turkeys you can buy. 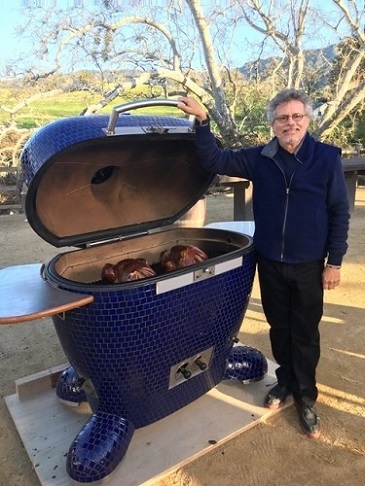 Our source for the show of organic, free-range, non-GMO, and air-chilled birds was Mary’s Turkeys in Fresno, California. Turkeys are harvested just once a year, so try to procure fresh birds if possible. If buying frozen turkeys, allow them plenty of time to thaw. You can brine the bird before proceeding. My basic formula is 1 cup of kosher salt to 1 gallon of water. Brine for up to 24 hours. Make a flavorful compound butter using cognac and fresh chopped herbs. (Find the recipe here.) Using your fingers, carefully tuck the butter between the skin of the breasts and thighs. The butter can be made ahead of time and refrigerated for several days or frozen for a month or more. Make an injection sauce, and working over a rimmed baking sheet, inject the bird using an injection needle. It looks like a hypodermic needle, but delivers broth, melted butter, and a little more cognac deep into the tissue of the bird. For even more “wow” power, slip very thin slices of fresh American truffles or whole sage leaves in a decorative pattern under the skin. It’s a trick I learned in cooking school in Paris. Our source for these truffles from the American northwest came from Washington state-based Foods in Season. Finally, set up your grill for indirect grilling/smoke-roasting and preheat to 325 to 350 degrees. 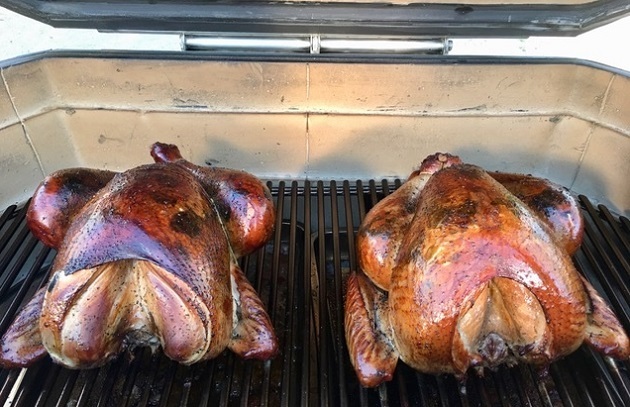 The higher temperature will give you crisp skin; birds roasted from start to finish at lower temperatures (225 to 275 degrees) develop rubbery, unappetizing skin. In the meantime, Happy Thanksgiving from Steven, Barbara, Nancy, Erin, Molly Kay, and Moira.